Two years ago we planted a rose bush outside the front window of our little house. It was a tiny plant, but it’s grown remarkably, and this Summer roses bloomed all season. In the Fall, when the trees around us turned such glorious colors, its blossoms remained. When winds finally blew the leaves from the winterberry, sassafras and redbud, still there were roses. The season has begun to turn again, and although a few leaves still dot the landscape, it is very much winter outside. Our trees are silhouettes; the undergrowth brown, the sky gray as often as not. This morning, during an early snow, I looked from my window. One bright pink rose clung to its stem, blessed and beautiful. I know it’s early yet. I know the flower won’t last through Christmas, if it even lasts the week. But it brought comfort, a reminder that life and loveliness remain even through the cold. I thought of the struggles so many of us face this time of year – ambivalence over the holidays, family squabbles, seasonal depression – and I remembered the simple blessings that help us make it through. I thought of the constant stream of negative news in the nation and the world, the stress and tension that come simply from living in such times – and I remembered the good news, the progress hidden beneath the negativity, bringing hope when hope is hard to find. This rose will be gone in another day or two, I’m sure. But the hope it brought, its reminder of the wonders of earth and the kindness of community, will not fade. 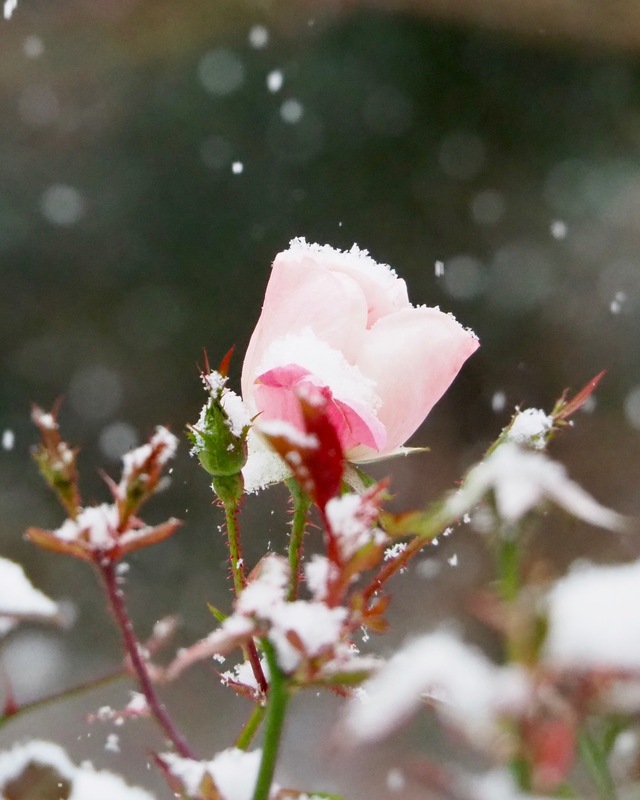 It will remain with me all winter, and like this rose, will live and grow until one day it blooms again in all its glory.